This recipe comes from “Kochen – Ein Rezeptbuch für alle Leute, die mit Leidenschaft backen und brutzeln, kochen und mixen und … essen” by Buchverlag für die Frau. In English: “Cooking – A Recipe Book for all People, who bake and fry, cook and mix and … eat with a passion” by the Book Publisher for Woman”. You will find the recipe on page 221. If you use dried lentils you need to soak them over night in sufficient amount of water. Since I had none I used two cans of lentils (about 1000ml). Prepare all ingredients, chop the onions, carrots and potatoes. Slice the leek and smokies and dice the ham. Heat the fat in a pot and lightly brown the onions. Then add the leek and carrots and let them sweat for 10 min. Then add the lentils including their liquid as well as bay leaf, clove, thyme and some salt. Mix in the beef broth and tomato paste. Let this cook for 15 min before adding the potatoes, ham and smokies. Cook the soup for another 15 min after which you check the softness of both lentils and potatoes. The soup is typically served with a bit of vinegar and sugar, the amount depending on your own liking. Nice mix of vegetables, meat and starch. 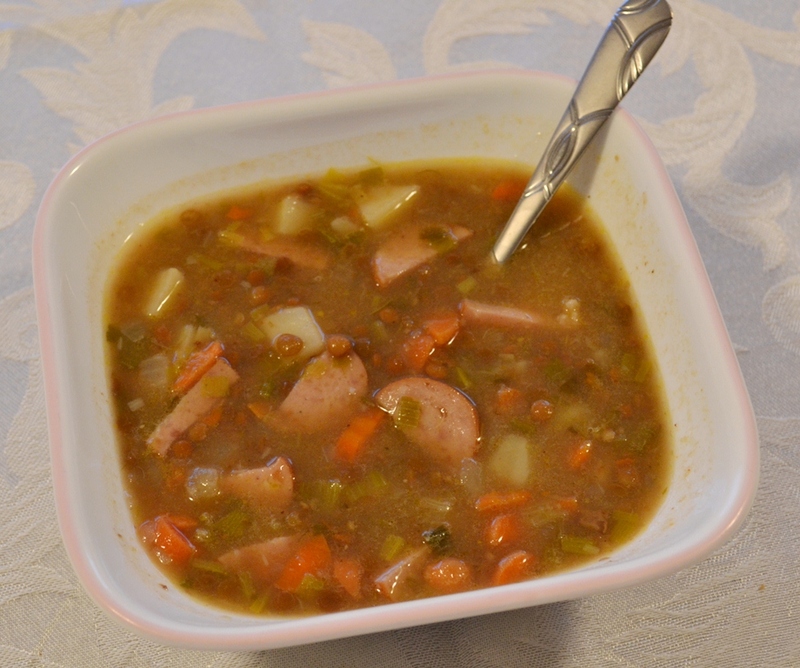 My Canadian family tried the soup without it first but my husband and sister in law where bold enough to try it with vinegar and sugar, and liked it. Frankly, my husband was much surprised how it changes and enhances the taste. *see, I knew it* It is an odd combination but really worth trying it. Now that I read what is in this soup, I find it hilarious that it is actually called Lentil Soup! 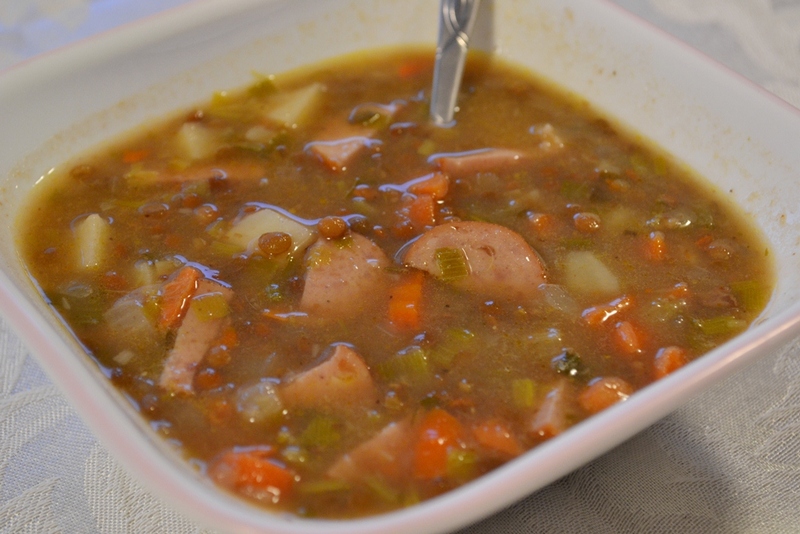 Sausage Soup or Bavarian Sausage Soup or Hearty Vegetables with Bavarian Sausage Soup would be more appropriate. One glance down the ingredient list after seeing the photo told me my husband would LOVE this! I wish I had a frame of reference for the sweet-sour flavour profile to know how much vinegar and sugar to add to finish the soup, but I will play with it and see how I do. It is almost more of a stew… almost. Actually, I do think the soup I had in Germany did have similar ingredients, but it was more of a broth served with the lentils… but I could definitely taste a sausage and vegetables had been used to create the broth, so maybe it is a variation of this soup… the poor man’s version at the side of the road. I am eager to try it! You are right, there is a lot of sausage, but you don’t have to do that. Sometimes I leave most of the sausage out and just add eome European Wieners. About the vinegar and sugar. This is to taste, so there is no real profile for it. Everyone takes as much as the like. I prefer more sugar, others like more vinegar. Just have it on the table and let everyone decide themselves.